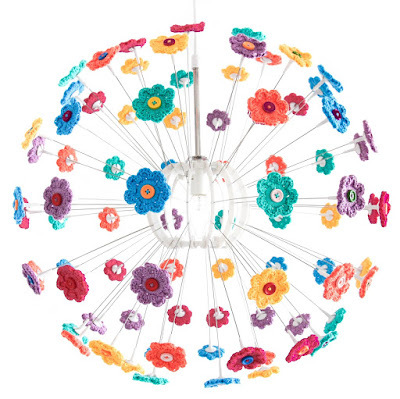 Adding a touch of spring to your home, projects or clothing, has never been easier with this pattern for our rather cute Mini Hoop Flowers. We originally designed this pattern as we wanted a set of sunny flowers to upcycle a lamp that was hanging in our apartment. The charming thing about these flowers is that their simplicity means that they are easy to make, but their bold design is more than enough to add a touch of flair to your projects without being over the top. The pattern involves crocheting into a plastic crochet ring, which gives the design it's splayed inner circle. On the Mini Hoop Flower Pattern Page page you'll find a convenient list of all the equipment that you'll need, as well as information about the yarn and hook size. You'll also find links to online shops, where you can purchase the same supplies as we've used. With all of this information you'll never be at a loss of how you can replicate these beauties! 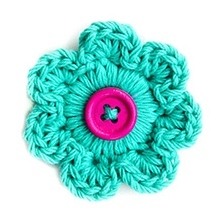 Why not stop by the Mini Hoop Flower Pattern Page where you'll find all the information on how to crochet this charming little pattern. You'll also be able to download the pattern there, with the click of a mouse. I love the set-up of your new blog! It's so user-friendly!